Hello! I cannot tell you my name, for fear that hordes of my intrepid student investigators will storm this site in a flurry of Googling. I see that someone else has already laid claim to the role of Waterboy. 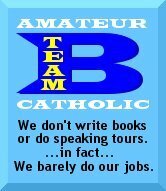 My niche having been filled, I would like to volunteer as Roadie to all the other Amateur Catholics. My blog, Scrutinies, is a chance for me to keep a record of my foibles as a high school religion teacher, unburdened by technicalities like a theology degree. All names are changed to protect the invincibly ignorant. I also started off my blog with a sonnet to the laminating machine in the library, which curiously did not win me a coveted nomination for "most bizarre post" or whatever the category is. You can expect to see me anytime I have mountains of papers to grade and want to procrastinate…just like now. Technically, I am paid to speak to impressionable youths each day, but since only 22% of them are listening to me at any given moment, I do not think this makes me a Professional Catholic. I also get a bunch of the minor prophets confused. Further documentation of my amateurism can be provided. I, personally, am most impressed by anyone who writes a sonnet to the laminating machine (especially one in the library, which is elegant in its specificity). Welcome aboard, Anonymous. Thank you!!!! I am honored to be part of The Revolution. Will there be instructions somewhere on this site for the template-impaired explaining how to steal...er, appropriate...the snazzy blue button? Rock on! Now I have a button! I have hit the BIG TIME! Must contact my portfolio manager to alert him of incoming funds from this lucrative new publicity tool. Er...I mean, ad majoram dei gloriam! I am pleased to be welcomed aboard, and it is with due deference that I request to be abbreviated as ATP, since there are so many Anonymous...es. Anonymos?